Ever noticed that auto makers always include the phrase “Introducing the all-new (whatever)” in their advertising? Who are they trying to kid? Even in our era of computer design and boutique manufacturing, no major auto maker can afford to completely re-tool every new model year—even if the platform is shared among a number of makes and models. Likewise in the motorcycle industry: evolution is far more common than revolution, and “bold new graphics” are often used to extend the life of superannuated drivetrains. The drivetrain was connected to the rest of the bike by two rubber bushings and a Silentbloc rubber cylinder head steady. The bushings allowed the engine to vibrate in two planes (back/forward and up/down), but not from side to side, thus preserving the directional stability of the motorcycle. It’s similar to Eric Buell’s Uniplanar concept, except that Buell used tie rods for lateral control, while Norton’s Isolastic system contained the rubber bushings inside steel tubes, using shims to control side play. 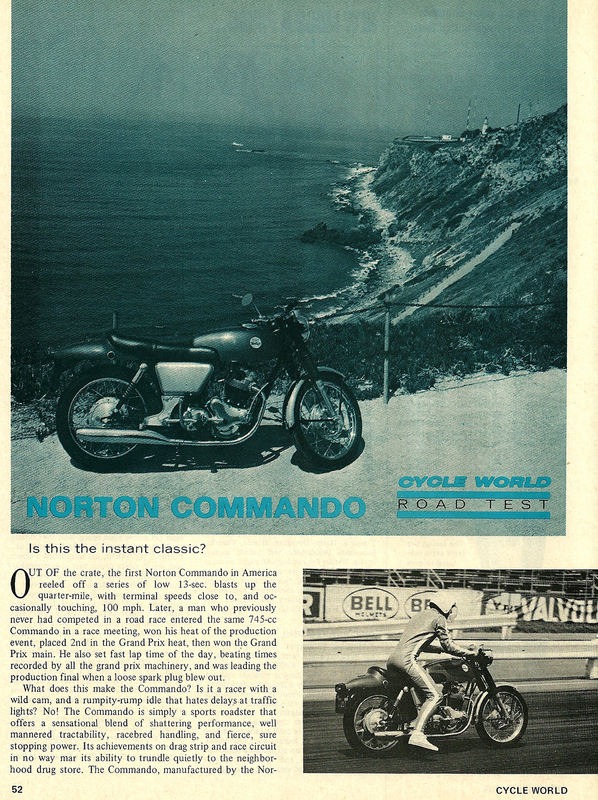 But the rest of the Commando was traditional Norton: the Roadholder fork; twin-leading-shoe drum front brake; four-speed gearbox; and kickstarter (electric start had to wait until 1975). Carburation was by dual Amal Concentrics and mufflers were borrowed from the Atlas. A new alloy primary case replaced the Atlas’s sheet metal item, and a new diaphragm clutch was used. And that was pretty much it. The new bike wasn’t without its issues, though, the most critical of which was the frame cracking below the headstock. 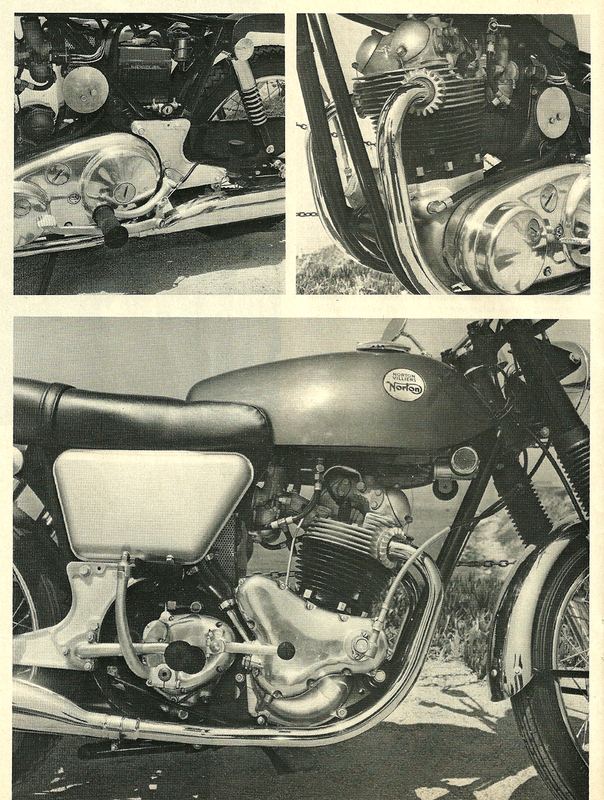 The issue was rectified in early 1969 by adding a cross-brace tube, but not before the offending item had become known as the “widow-maker.” Most of these bikes got retrofitted with the new frame. But not Darwin Sveinson’s. The Surrey, BC resident believes his Commando was one of the first few production machines finished in the Earls Court show livery. Sveinson’s Commando was selected for the 2016 Crescent Beach Invitational Concours d’Elegance. And it’s the feature motorcycle at the 32nd Annual Classic & Vintage Motorcycle Swap Meet and Show ‘n Shine at the Cloverdale Fairgrounds in Surrey, BC on Sunday April 29, 2018. www.classicbikeswapmeet.com.